Opposing inclusion of part of the territory of Changlang district of Arunachal Pradesh in the proposed Nagalim, leaders of various tribes in Arunachal Pradesh on Monday demanded disclosure of the content of Naga framework agreement between the union government and NSCN-IM. They also decided to send representation to the government at the state and the centre apprising them of the true demography, culture, tradition and geography of the district. Leaders of Singphos, Khamtis, Ahoms, Deoris, Chakmas, Hazong, Sonowal Kacharis,Yobins, Adivasi and Gorkhas resolved to resist such move of the union government from implementing the Article 371(A) in the non Nagas areas of the district. Former minister of Arunachal Pradesh CC Singpho who had presided over the meeting said, “We would rather prefer shedding our blood to submitting meekly to the Article 371(A) ceding our territory to the Nagas’. 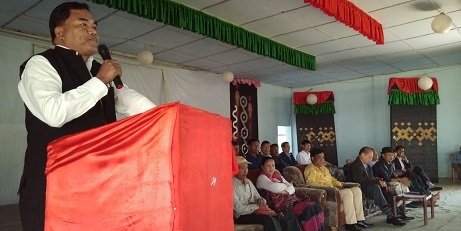 Other speakers including Mayong Maio the BJP state secretary, Tongko Singpho the ZPM Bordumsa, Romesh Gogoi of the Yuba Morcha, Lititso Yobin, Mukut Deori, Chaw Pingyak Singpho, Sindu Nong Singpho the Chairman Bordumsa Anchal Samity also expressed their resentment to this effect. Leaders have lambasted the BJP led Government in Arunachal Pradesh terming it ‘mute spectator’ for not initiating steps to intervene to this effect. They have resolved to form a committee to spearhead the movement resisting the implementation of the said Article of the Indian Constitution in Changlang District to realise the end.